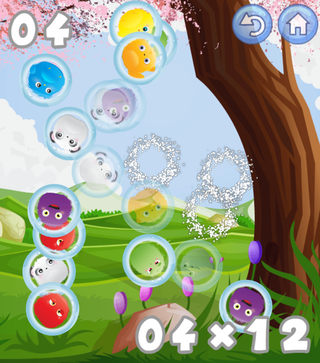 Touch the screen anywhere to save funny monster and watch the bubbles burst. Release as many monsters as possible, they want to break free. You have to pop a certain amount of bubbles for moving on to the next level. I really liked the game but there are no instructions in the game? I had to go back to your post to figure out how to play the game. I also thought the "x" was some sort of multiplier, not how many you needed. Noty sure how big of problem that is. Could maybe be solved by some short tutorial. And when a bubble has burst and the animation has stopped I think it should fade out just a little bit quicker, or maybe start fading just before the animation is completed. Other than that I thought it was great. Like Karma Octopus said, it's not 100% what to do at the start but it's pretty easy to figure it out quickly. The fact that you've changed the 'X' to a '/' helps a lot with understanding the goal of each level.